To anyone looking at this very post, you might be wondering: “What in the world happened to this blog! ?” about that… I, sincerely apologize very much for the massive delay of updates on this game project development blog as I was absent from class for the past 2 weeks of 13th February & 20th February. However, as I was away, I have spent every nick of time available to me to create & eventually improve my project build & detail the updates in my project. To compensate the logs I’ve missed for the past 2 weeks, I’ve decided to compose all the logs that are supposed to be posted before into 1 single, huge post the updates I’ve done including posting the project build! I would like to reiterate some of the updates from Project Iteration #1. The images used to present the enemies & the player ships aren’t fully clear & explained which is why I’m introducing some new changes to the project. I’ve decided to remove the enemy image below as it didn’t meet within my criteria for my game. I wanted to focus on a specific type of enemy that would fit in my game. Some of the images below are the same images I’ve used for my mockup. However, I’ve thought of using an earlier idea mentioned in Iteration #1 where I would use the visual colours of the enemy sprites to represent what kind of projectiles they are firing. The 2 tiny sprites below this paragraph are the regular enemies intended for the game. …while the large sprites below are intended to be the bosses for the game’s stages. 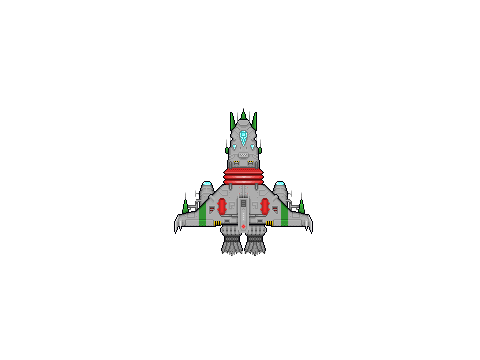 The sprite below is intended as a ship that can only drop powerups for the player to obtain in order to switch bullet colours. And finally… below is the player ship sprite intended for the game. I decided to only use of them as the 2 player ship images in Iteration #1 are only intended to be shown as a concept for the game. I also intend to add at least 2 stages in this game to demonstrate the different types of enemies appearing on each stage. One of the ideas I implemented into my game is a type of ship I intend to use only drops powerups. This idea originates from another shoot em’ up arcade game which has this feature. In the game “Ultra X Weapons/Urutora Keibitai”, during gameplay, a particular ship will appear in the player’s view in attempt to fire at the player. Destroying said ship will always drop out a powerup item that either increases firepower or gives the player missile weapons. The picture below shows the “powerup drop” ships I used as an example circled in red. The stages’ backgrounds I used for my project only depicted space backgrounds. I planned to have my shooter take place in outer space as a shooter involving futuristic-looking aerial vehicles wouldn’t look unnatural in an outer space setting. One of the games I’ve used as reference, “Ultra X Weapons/Urutora Keibitai” depicts 2 stages (Stages 6 & 7) which took place in outer space. Stage 7 has the stage setting entering an enemy space station on the Moon. The pictures below displays how the space stages look in the game. The prototype build is finally made! Here you can see my progress of how my game works. Here is the link to my prototype build. Remember that the game requires Stencyl to play. Finally, here’s the final (, final) product of my shooter project! Please feel free to try it by clicking on the link below. However you’ll have to download it since the link redirects you to a Goodle Drive shared folder. But don’t worry! After downloading the file, all you have to do is to drag the swf. (Shockwave) file to your web browser in a new tab and you’ll be able to try out my shooter. The differences in this version so far, is the addition of the 2nd level with the enemies and bosses added. The controls for the game remain the same as the prototype game.